This sprawling OddWorld sequel retains the formula of the original game while incorporating bizarre new creatures, expansive new environments, and added gameplay techniques. This time our Mudokon alien hero is infiltrating a massive bone-processing factory (Mudokon bones of course). Exodus comes spread over two disks with a 60-page instruction booklet, giving some indication of just how big and involved this adventure really is. The industrial environments are not quite as dark this time, but still offer the same brand of thoughtfully designed puzzles. There's usually only one way to solve each one, and your execution needs to be near perfect. Like the first game, speaking simple commands plays a key role. One useful new phrase is "All Y'all", which allows you to address several of your Mudokon friends at a time. Later in the game you can "possess" other creatures, and each species has its own limited vocabulary. Another new element is the "mine cart", which actually resembles a big wheel that crushes everything in its path. Tubes can be used to move between areas, and well-rendered cut-scenes do a nice job of conveying Abe being whisked between locations. Like the first game, it's cool how you'll often inadvertently preview new areas as you move through the contiguous screens. Perhaps the best new feature of Exodus is its "quick save", which lets you save your progress at the touch of a button. Like all OddWorld titles, a quirky sense of humor pervades your journey, from the green clouds caused by fluctuation to blind Mudokons who miss escape portals and jump into walls instead. A two-player coop mode is also included, but it's alternating turns only, and I really didn't have the patience for it. Exodus is a well-constructed adventure, but the benefit of the new features is largely offset by the games' more elaborate and demanding puzzles. Exoddus will thrill those who mastered the first game, but for newcomers this is a heck of a lot to chew. © Copyright 2008 The Video Game Critic. Abe's Oddysee was considered fresh and innovative upon its release, and it still retains those qualities many years later. Not only did OddWorld deliver quality 2D gameplay on a system best known for its polygons, but it conveyed a very distinctive style and dark atmosphere. 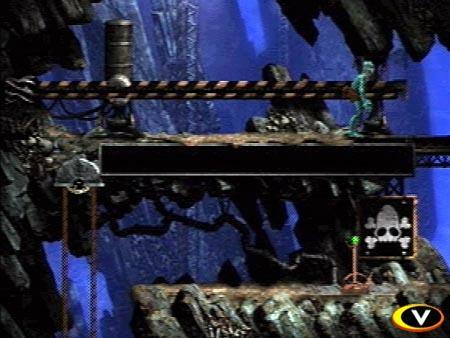 Abe's gameplay is similar to 2D adventures like Flashback (Genesis, 1995), but OddWorld takes the formula to the next level with innovative features and excellent graphics. The main character is a goofy-looking "Modokon" alien forced to perform slave labor in a meat factory. When Abe discovers that Mudokon is the main ingredient in the latest product, he makes a bid to escape. Getting Abe to safety requires trigger reflexes and puzzle-solving abilities. To help me review this challenging game I enlisted the help my buddy George, who's not only a big fan of the Oddworld series, but also bears a striking resemblance to the main character. As Abe sneaks between contiguous screens in the dark industrial facility, he can save his fellow Mukodons by sending them through escape portals. This requires him to first communicate using a number of simple phrases like "hello", "follow me", and "wait". Saving Mudokons is optional, but dedicated gamers (like George) will go to great lengths in order to save every last one. Along the way you'll need to evade nasty guards with claw-like heads and yapping dog-like creatures. Abe is unarmed but can lure adversaries into trap doors and meat grinders. OddWorld incorporates a lot of stealth elements like tiptoeing past sleeping guards, hiding in shadows, and fooling motion detectors by standing still as their beams pass over. The character animations have a whimsical charm, and the dark industrial scenery is rendered with an artistic flair you'll rarely find in a 3D title. An ominous musical score adds tension, with great stereo sound effects that often cue you in to what's in the next room. Abe's Oddysee is a satisfying adventure, but only if you have the patience. Many areas need to be tackled in a strategic, deliberate manner, with little room for error. You will die a lot in this game, and the trial-and-error nature of it all can border on tedious. You can save your progress from the pause menu. OddWorld is not for everybody, but gamers looking for a more cerebral challenge will be hooked. © Copyright 2008 The Video Game Critic. This game was a big deal when it was previewed in 1997. Offering non-stop action and incredible explosions, many magazines predicted this third-person shooter to be game of the year. Control problems ultimately prevented One from reaching its potential, but it's still a wild ride. You play John Cain, a Rambo-like hero in a 3D, Blade Runner-like world. As you run for your life and blast everything in sight, you're pursued by planes, helicopters, and an army of soldiers. Everywhere you go, from the roofs of a metropolis to the depths of an undersea lab, mayhem follows. There's some occasional slowdown, but let me tell you, the amazing explosions and utter devastation is a beautiful sight to behold. When a plane swoops in and destroys a bridge you just stepped off of, it's quite a rush. You can blow up just about everything, and even enemy soldiers explode when you shoot them! Talk about gratuitous! The graphics and scenery are terrific, and the audio, featuring the radio conversations of your pursuers, is interesting and fun. So what's the problem? There's simply too much platform jumping, and the touchy analog controls aren't up to the task. You'll blow your way through most of a level without losing a guy, and then miss five jumps in a row. Frustrating! Even so, One offers dishes out enough action and carnage to satisfy most shooter fans. © Copyright 2000 The Video Game Critic. With so many cartoonish golf games on the market, it's nice to play something with real golfers and actual courses. 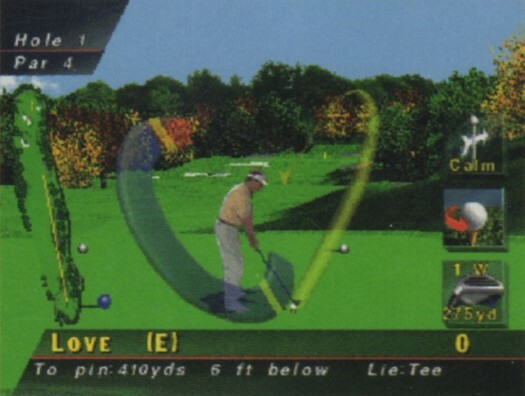 Electronic Arts did a fantastic job with PGA 96. It's considered by many to be the best of EA's Playstation golf games. The two beautiful courses included are River Highlands and Spyglass Hill. The holes are pre-rendered, unlike the chunky polygon courses in modern golf games. You don't get the benefit of moving cameras or multiple angles, but the graphics are photo-realistic - making you feel like you're on a real course! The bright green fairways set against the deep blue sky are a sight to behold, and the fourteen digitized pros swing smoothly and react to their shots appropriately. 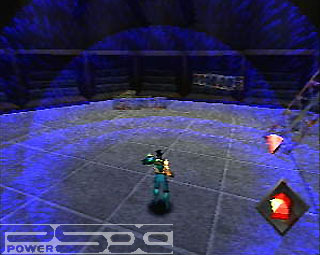 PGA 96 is easy to play, with simple, responsive controls. There are occasional pauses with the disk loads, but nothing excessive. In fact, the game moves at a rather nice pace. The audio could be better. The sound effects are virtually non-existent, with the exception of an occasional bellow of a sea lion in Spyglass hill. Could they make that sound effect any louder? It sounds like he's on your back for Pete's sake! There's a commentator, but he only chimes in before putts, and talks in a polite whisper. With fun gameplay and classic good looks, PGA Tour 96 is one golf game that should pass the test of time. © Copyright 2001 The Video Game Critic. This is a fitting tribute to the little yellow guy on his 20th anniversary. This package actually contains three unique games. First, you get an arcade-perfect version of the original Pac-Man. Next, there's the "Maze Mode", which updates the original game with 3D graphics and imaginative stages including a pirate ship, fun house, and a haunted house. 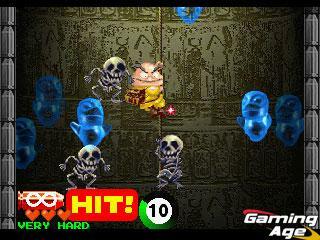 But the main attraction is the 3D "Quest Mode". 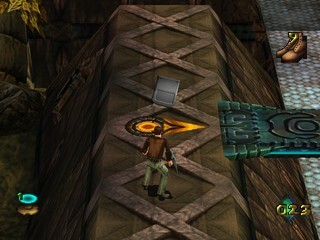 In some ways it's a typical 3D adventure as you jump between platforms, collect items, and push buttons to open doors. However, Quest is smaller in scale and less complicated than most, so you won't be overwhelmed by huge levels or move combinations. But you will have fun. With its excellent production values and timeless gameplay, Pac-Man World is a likeable package that should appeal to a wide audience. © Copyright 2000 The Video Game Critic. Although saddled with a lousy, inappropriate title, Pandemonium did boast some innovative graphics for its time. 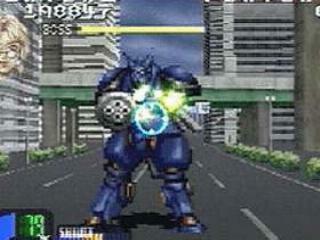 Its gameplay is strictly 2D, but the graphics are 3D rendered, allowing for camera angles that twist and turn around the action. The result is the best of both worlds - a platformer that's easy to play and mesmerizing to watch. Like a Sonic game, the object is to reach the end of each stage while collecting coins and other items along the way. Traps and adversaries cross your path, but pouncing on enemies will make them disappear. Pandemonium is a rather linear game, but there are occasional branches in your path. 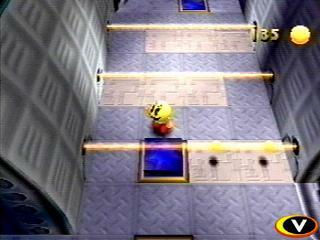 Eighteen large stages take you through dungeons, villages, forests, and caves, but these are wildly uneven in quality. The first stage is sensational, with its lush foliage, scenic waterfalls, and majestic palace. Unfortunately, the advanced stages aren't up to the same standards, and they gradually degenerate into simple caverns and boring platforms. Pandemonium's renaissance-style music is very well orchestrated, and a handy password is displayed between stages. If I have one issue with this game, it would probably lie with the two playable characters, who are decidedly uncool. I can tolerate the girl, but that jester in the sneakers looks like a complete dork, and watching him in that corny opening video is almost creepy. Pandemonium has faded into obscurity, but its innovative style of gameplay lives on. © Copyright 2000 The Video Game Critic. This unlikely but highly imaginative game plays like a series of interactive music videos. In Japanese, Parappa means "paper thin", and the graphics reflect that with their flat cartoon characters. Although Parappa's visuals are simple, the well-defined graphics have a unique style all their own. The music is excellent, although some of the rhymes are extremely corny. Each stage has its own distinct beat, from rock to raggae. 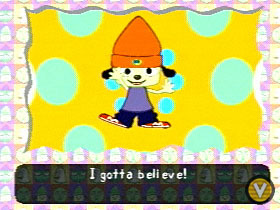 The simple controls require you to hit combinations of buttons to the rhythm of the song, causing Parappa to rap, although his words sound a bit disjointed. The characters and backgrounds transform depending on your performance, and there's even some room for you to get creative. Parappa the Rapper is a triumph of originality, and younger gamers in particular should have a ball with it. © Copyright 1999 The Video Game Critic. Philosoma feels like a classic 2D shooter trapped in a 3D polygon world. Your ship is positively huge and you can unleash an impressive barrage of rapid-fire shots. 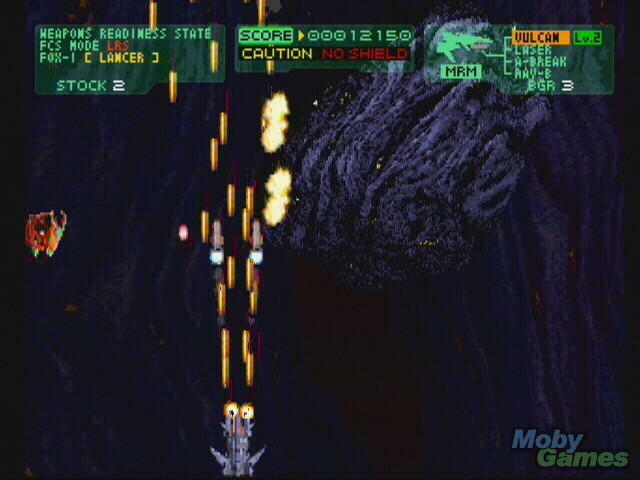 The opening stage is a vertical shooter with asteroids, but they don't crumble easily. You can weave your way through them, but it's a tight squeeze. Enemy ships make their entrance by whizzing past the camera before settling into shooting range. This scaling effect is neat but it obstructs your view. Subsequent stages offer a variety of 2D and 3D viewpoints, and I like that. The 3D stages wind through some dark valleys, and they probably looked pretty impressive back in 1996. In general the 2D stages look like crap but are more playable. You can toggle between several weapons, each of which can be powered up. The rapid-fire vulcan is the most practical weapon but wiping the screen with the laser beam is also satisfying. The stage sequence is bizarre. Sometimes it feels like you're playing the same stage (or even fighting the same boss) twice in a row! A female radio voice alerts you to approaching enemies, and yeah, she actually called that boss "Doggy House". Save your smart bombs for the bosses, who tend to crowd the screen. I find it super lame how the larger defeated enemies just tend to smoke and drift off the screen. That doesn't satisfy my appetite for destruction. Full-motion video intermissions frequently interrupt the action, which were also pretty cool in 1996. Now you can skip them with the start button. Continues are available, but they take you way, way back. Philosoma is not particularly good, but if you enjoy shooters you might appreciate this strange, lost relic of the PS1 library. © Copyright 2013 The Video Game Critic. As with most early PS1 titles, Pitfall 3D kicks off with an obligatory full-motion video introduction. The story is an incomprehensible tale but the narrator sounds familiar. Hey, that's Bruce Campbell of Evil Dead fame! I'm liking this game already! Beyond the Jungle attempts a major franchise transition, easing the player into the third dimension with a gentle learning curve. As the title implies, it ditches the jungle environments for underground dungeons with magical mechanisms, floating platforms, and tacky yellow arrows that point the way. As if the arrows weren't enough, you can always follow the trail of huge blue gems. In a nod to the original Pitfall (Atari 2600, 1982), Beyond the Jungle incorporates disappearing pits, rolling logs, scorpions, and gold bars. When swinging on vines Bruce Campbell unleashes a mean Tarzan yell. The controls are digital-only so moving diagonally can be hard on the thumb. Pitfall 3D requires you to navigate a lot of floating platforms in dark environments. Fortunately the game incorporates "whoops I almost walked off that edge technology", saving you from a lot of careless deaths. Sadly, you do not have the benefit of "ledge-grabbing jump technology". 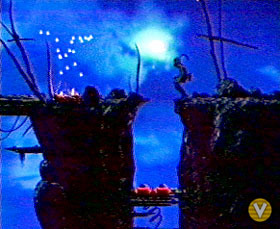 The stages are peppered with random enemies like apes, flaming skulls, pixies, and pterodactyls. I find it odd how you can't harm those puny scorpions, yet giant rock monsters go down with one blow of your pickaxe. Among the traps and hazards is a mysterious blue liquid that causes Harry to levitate over it. The graphics are very good but depth perception is an issue when hopping between platforms. The stages are pretty big, so when you complete one you feel like you actually accomplished something! You can save after each stage and sometimes even in the middle of a stage. Bruce Campbell keeps things light with random one-liners like "Sayonara! ", "Let's rock! ", and "Step aside, coming though!" Pitfall 3D is fun for a while, but I grew weary of the cookie-cutter stages and ubiquitous items. Do I really need to collect all these blue diamonds and poker chips? After a while I started to wish I was back in the jungle again. © Copyright 2013 The Video Game Critic. This whimsical carnival-style light-gun shooter offers more than 70(!) random stages. Each stage lasts only a few seconds, challenging you to shoot down a series of targets, usually with limited ammo. A nifty split-screen mode allows two players to go head-to-head, which is definitely the highlight of the game. You'll take aim at everything from birds to cardboard ninjas to skeletons leaping from their graves. In one stage, you have a single bullet to shoot an apple off of a man's head! Point Blank utilizes Namco's Guncon, which is by far the most accurate light-gun on the market. Point Blank's sheer variety and easy gameplay make this the premiere light gun shooter for the Playstation. © Copyright 1999 The Video Game Critic. These Point Blank games offer basic but entertaining light-gun action, with over 70 random stages. Like the first game, Point Blank 2's graphics and sound effects are not particularly impressive. There are no digitized images or polygon bosses - only cartoonish sprites. The new "party mode" lets up to seven(!) friends compete, although only two can play at a time. Most stages are only a few seconds long, challenging you to shoot a minimum number of targets. Many are holdovers from the first edition, but there are a few surprises. In one alarming stage, a car is falling out of the sky towards you, and you have to shoot it 76 times to destroy it! In another stage you have to shoot pieces of a knight's armor. In one of the single-shot stages, you're required to shoot a stopwatch once it reaches a fraction of a second. The one-player variations are mildly amusing, but with unlimited continues, they're not much of a challenge. The two-player mode is where it's at. One major flaw with both Point Blank games is the ridiculous number of set-up screens required to begin a game. I can't even imagine trying to organize an eight player game! As with all Namco shooters, this requires a Guncon controller - the best light gun on the market. © Copyright 2000 The Video Game Critic. 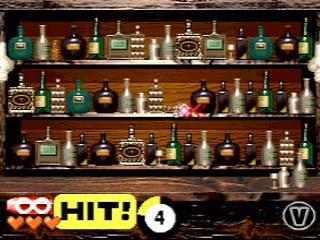 Point Blank was the premiere light gun series for the Playstation, and if you haven't experienced this game yet, you're missing out. Like its predecessors, Point Blank 3 provides a whole slew of mini shooting games (over 80) which are designed to be played against a friend. Yes, you can play them by yourself but they aren't nearly as fun that way. Although the stages here are all new, they are highly derivative of those in previous Point Blank games. Typical challenges include protecting a person from projectiles, shooting the matching shapes, or hitting a small target with a single shot. 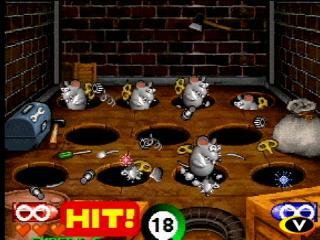 The cartoonish 2D graphics are smoothly animated and easy on the eyes, but the wacky music can be somewhat irritating. How this game earned a "Teen" rating I have no idea, because it seems very childish. One interesting new feature is how your performance is rated based on brainpower, dexterity, judgment, and rhythm at the end of each contest. High scores are saved for each stage, but if you're using the unlimited continues (and you will), the scores don't mean much. There are still an inordinate number of set-up screens. Point Blank 3 delivers plenty of arcade shooting action, but its novelty is wearing thin. © Copyright 2003 The Video Game Critic. 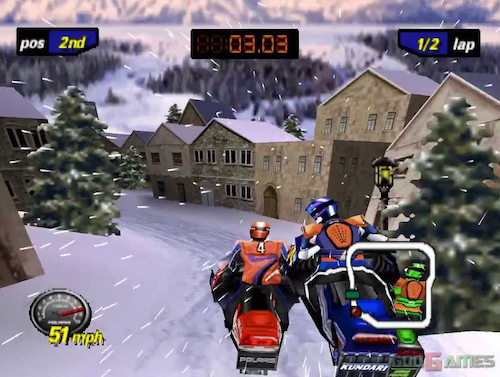 A game like Polaris SnoCross holds little appeal for most of the year, but once there's a fresh coating of snow on the ground games like this call to me. The live action intro gets you psyched up like CGI never could. The first track is ideal for putting you into a festive winter mood as you race through a cozy snow-covered village before heading out over tree-lined ridges and rickety bridges. 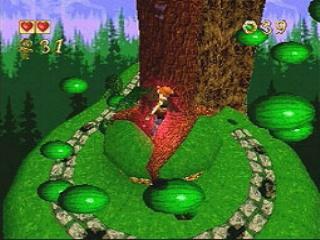 The visuals are much better than the Nintendo 64 version, with better-defined scenery and no noticeable draw-in. The music consists of understated electronic beats. Be selective when choosing your new snowmobile before each race. Go with the one with high top speed or else your three CPU competitors will crowd you out of the field. Fortunately they tend to wipe out on their own which helps level the playing field. Expect a lot of bouncing around as you bound over hills and jostle for position. The tracks are a bit on the long side but multiple paths keep things interesting. The single-player tournament mode lets you unlock new tracks and a split-screen supports up to four players. The four-player mode is disappointing though because the first-person view makes it impossible to see your tricks. The night tracks feel like a missed opportunity. Instead of a village illuminated with holiday lights, it looks like someone just turned down the brightness on my TV. The game also seems a little buggy, locking up on one occasion. Polaris SnoCross has its problems but it's perfectly good for curling up with on a cozy snowy night. © Copyright 2018 The Video Game Critic. Well, it's 1999 and guess what - we're still playing Pong! Who would have thought? To all you cynical people out there who think this game is a big joke, I've got news for you: Pong is fun! This updated version preserves the original classic gameplay while incorporating state-of-the-art 3D graphics, excellent music, and loads of power-ups to spice things up. There are dozens of stages, and each has its own distinctive look and feel. 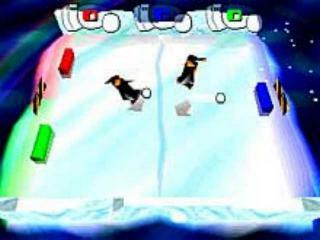 One stage features a flat iceberg with wandering penguins, and when a penguin is hit, it places another ball into play. Power-ups include seals that handle missed balls, and a polar bear who tilts the iceberg. It's pretty wild! Another stage is set on a soccer field, where you control two sets of "paddles" at once. Advanced levels become ever more complicated, allowing you to catch and aim the balls. I like the variety of this Pong, but to be honest, the later stages are less fun than the simpler ones. Pong's control is fair but could have been better. The analog-controlled paddles tend to gain momentum, making it impossible to reverse direction immediately. As a result, you tend to "overrun" and miss balls. Pong is an addictive one-player game, but it's the two to four-player modes that will make believers out of your friends. Hasbro deserves to be commended for bringing back this classic oldie in grand style. © Copyright 1999 The Video Game Critic. When was the last time a good volleyball video game was made? I'm guessing Kings of the Beach for the NES, and that was way back in 1988! 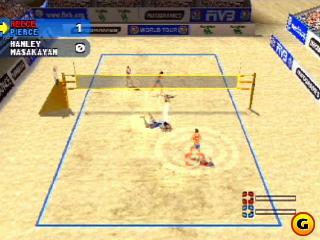 Power Spike is no classic, but it will satisfy some gamers with a craving for volleyball action. As a volleyball player myself, I was pretty psyched up about Power Spike Pro, especially with mega-babe Gabrielle Reese featured on the front cover. Power Spike gets off to a good start with a short video montage featuring some hot-looking women players in action. There's a long list of men and women pros to choose from, but once the action gets under way, the first thing you notice is the lousy graphics. My friend Scott even asked "Is it possible to give the graphics an F-?". The rough, poorly rendered players do look pretty sorry. There are several beach locations, but they all look the same, with huge crowd stands blocking what could have been some attractive scenery. But the number one problem by far is the camera. No matter what angle you select, you are always too far away! It's like watching the game from the nosebleed section! Forget about the four-player action; the two-player mode is hard enough to watch. The sound effects are abysmal, with uneven, disjointed crowd noise. The players seem to yell unintelligible phrases like "Nobody!" for no reason. The control is a mixed bag. Players move nervously, but the control scheme makes targeting the ball easy, and I love the way you can aim your shots. If you can look past the poor graphics and sound, Power Spike does provides some decent one or two-player volleyball action. © Copyright 2001 The Video Game Critic. 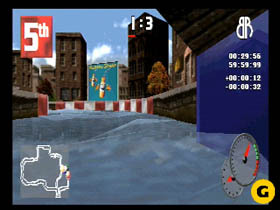 Powerboat Racing suffers from the same problems that plague so many other Playstation water-racing games, namely narrow tracks and poor controls. The nine courses are scattered throughout different countries around the world including Japan, Monaco, Norway, and England. Personally I would have preferred more exotic, tropical locations. The scenery isn't bad, but the pop-up is outrageous, even in the one-player mode. The courses sometimes change their path dynamically, which is supposed to add variety but instead confuses the hell out of the racers! And why in the world are these tracks so [expletive] narrow?! You'll be spending most of your time trying not to hit the walls. It doesn't help that the digital controls are so oversensitive, causing you to oversteer all over the place. Powerboat Racing does offer a split-screen mode, and the game does provide a certain level of amusement if you can accept its flaws. © Copyright 2001 The Video Game Critic. Do the words "best multiplayer game ever made" mean anything to you? If so, you should check out Poy Poy, which also gets my vote for most underrated game of all time! Don't let the silly name and goofy graphics fool you - this game is an absolute riot with four players! 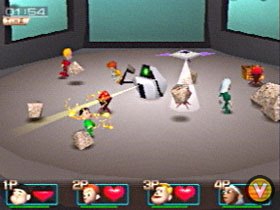 Each player controls a small cartoon character on a 3D playing field. Rocks and bombs litter the course which can be thrown at your opponents. It's even possible to grab another player and throw him around like a rag doll! Now that's disrespectful! Toss in some special weapons, monsters, and mystery crates, and the result is total chaos. Rivalries and alliances are formed and dissolved to keep one player from scoring too high. Insanely competitive and often hysterically funny, Poy Poy is one for the ages. © Copyright 1999 The Video Game Critic. I own so many versions of Primal Rage I completely overlooked this Playstation edition. It's an extremely close port of the coin op that used to enthrall me at Mr. G's sub shop back in 1994. All of the awesome cinematics are included, along with several extraneous modes I never play. The opening line of the instruction booklet reads: "Eons ago, before humans walked the planet, there was rage." Primal Rage pits dinosaurs and giant apes against each other in a post-apocalyptic world. Stylistically this has got to be one of the coolest games of its era. You have to love those huge, stop-motion animated creatures. You'd think dinosaur attacks would be limited to bite and tail whip, but the developers concocted plenty of imaginative special attacks including venom spit, freeze breath, and ground pounds. The fascinating stages incorporate towering glaciers, volcanic ruins, and dilapidated skyscrapers. The fighting action is fine but certainly not on the same level as Street Fighter or Mortal Kombat. The controls are a little stiff and the collision detection is loose. You really need to have a special move or two under your belt to make much progress in this game. The manual lists several for each creature, but why did they have to refer to the buttons by numbers? It would be a lot less confusing if they referred to "button X" instead of "button 3". Using the same attack too often causes a "no cheese" icon to flash, yet that didn't prevent me from liberally applying Vertigo's venom attack to take down a string of foes. I noticed a lot of subtle details in this version of the game, like the way Sauron's tongue hangs out of his mouth or how Vertigo spits at the camera. The continue screen features a chick imploring you to keep going, and she looks a lot like Dana Plato. There's a high score screen but sadly it doesn't save to memory card. 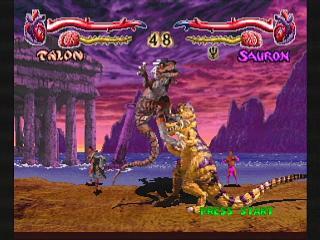 Primal Rage may go down in history as an average fighter, but the game still remains a spectacle to behold. © Copyright 2017 The Video Game Critic. 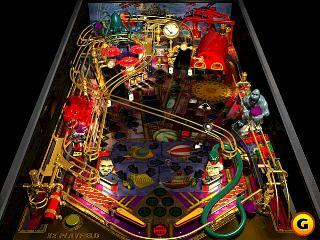 Empire knows their pinball, and their Pro Pinball series of pinball games certainly deserves its "simulation" label. The tables are photo-realistic and the physics is remarkably accurate. This particular four-flipper table has a racing theme. Although it is meticulously detailed, you can't really appreciate it during the actual game. The far end of the table is not only difficult to make out, but it's blocked by a semi-transparent scoreboard! That doesn't mean you won't have a good time with this. Despite the fact I couldn't tell what was going on most of the time, I always have fun trying to top my high score. © Copyright 2001 The Video Game Critic. Wow, this has got to be the most realistic video pinball game I've ever seen! Fantastic Journey only has a single table, but it contains an amazing number of lights, rails, and contraptions. The retro theme is "inventions", featuring blimps, planes, and submarines as envisioned in the early 1900s. 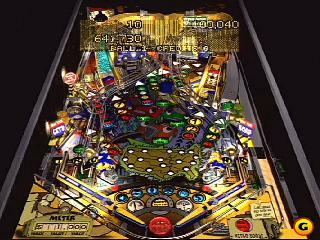 Like real pinball, the controls are limited to moving the flippers and nudging the table, both of which are quite responsive. It sounds simplistic at first, but the gameplay becomes quite a bit deeper once you learn how to activate certain gizmos, access new areas, and perform combos. This game had me hooked! The table is viewed as you would see a real pinball table. Unfortunately, although the table is finely crafted, the far reaches are difficult to see, so you can't truly appreciate the level of detail unless you use the "examine table" option on the title screen. It's truly remarkable how much work went into the graphics, but it's a shame how much of that is lost during the actual game. Fantastic Journey has plenty of customization options, and even the background music is excellent. © Copyright 2001 The Video Game Critic. I first played this game in 1996 with my friends Steve and Brendan who had rented it from Blockbuster. I didn't appreciate Horned Owl at the time - probably because I had to watch those two guys play through the whole thing, which seemed to take forever. In retrospect, I consider it one of the better light-gun games available for the Playstation. Project Horned Owl lets one or two players fly around in mech-like suits, destroying armies of robots in the middle of a city. Your shots travel like missiles, so you can effectively "lead" them into targets. You also have an arsenal of grenades that blow up everything on the screen. The gun accuracy is excellent considering that this game does not support Namco's Guncon. In addition, you get about fifteen bullets per round, allowing you to fire rapidly without having to reload constantly. Horned Owl's background story is presented using a series of high quality anime cut scenes. Voices accompany the on-screen action, keeping you posted on your ever-changing mission. While the enemies are rendered as flat sprites, they still look great. When shot, the metal beasts explode convincingly and crumble to the ground as burning heaps of scrap metal. If the game has a flaw, it's the fact that it's too easy. If you use your three continues on "normal", you can beat the game in one sitting, which takes about an hour. Still, there aren't many light-gun games on the Playstation that provide this level of shooting satisfaction. © Copyright 2002 The Video Game Critic.